Shashwati Talukdar is an independent filmmaker whose recent films include ‘Please Don’t Beat Me, Sir!’ (2011) and ‘Wall Stories’ (2014). Her work ranges from documentary, narrative and experimental and has shown at venues including the Busan International Film Festival, Margaret Mead Film Festival, Institute of Contemporary Art in Philadelphia and the Whitney Biennial. 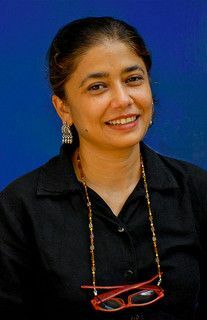 Shashwati worked as an editor in the film and television industry, where she got her start as an assistant editor for a TV show by Michael Moore. Shashwati has taught at NYU, Arcadia and Temple University. Visit Shashwati’s production company: Four Nine and a Half Pictures. Short and experimental films. Visit Shashwati on Vimeo to see more.